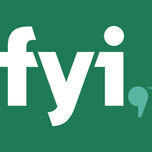 What TV providers support the FYI app? For now, we enable Comcast, DIRECTV, Cablevision, Verizon FiOS, Time Warner, Dish, Bright House, and other subscribers to sign in to the app. We will continually add more providers. How much does it cost to use the FYI app? Where do I get my sign in information? Can I use the FYI app if my TV provider doesn't support it? Can I disable the ads from appearing in the FYI app?